BACKGROUND INFORMATION. I am Lloyd Rowcroft and welcome you to my web site. 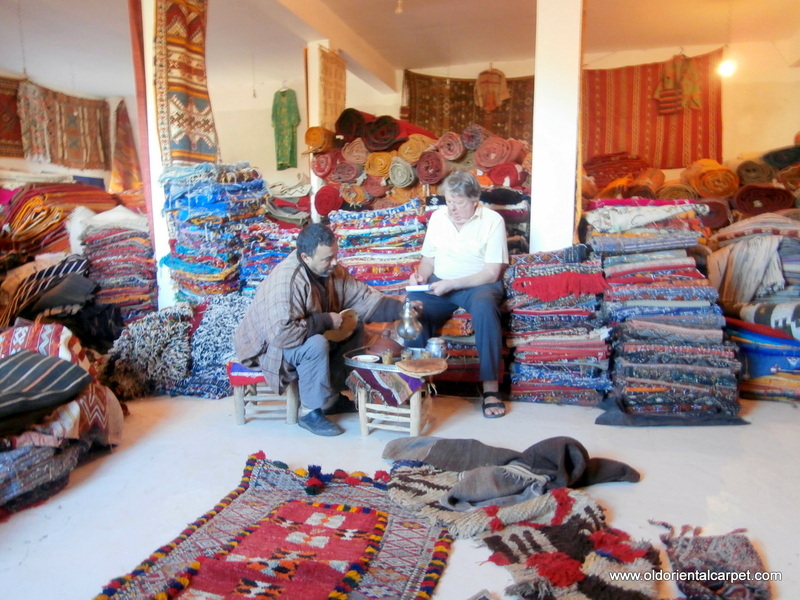 I specialise in rugs and textiles from Central Asia and Morocco, and, as I live in the southern tip of Spain and Morocco is only a 35 minute ferry ride away, am able share my time between these two countries. I have a keen interest in Central Asian pieces as during the 1980’s and 1990’s I made many trips through that region to buy rugs. All the pieces on this website are in my studio in Spain. Buying rugs recently from a Berber trader in the High Atlas mountains of southern Morocco. The bottom photo shows the buying of rugs from Afghans in the North West Frontier near the Khyber Pass in Central Asia. 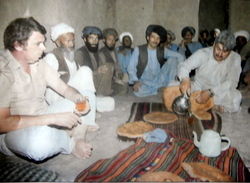 Although taken 30 years apart the common denominator of enjoying bread and tea before discussions begin is shown in both. Fortunately some things never change. Each piece sold is accompanied by an email file containing photographs, detailed description including origin, age and text book references where available. Notes on care and maintenance are also provided. I have several hundred customers and have shipped to 36 countries. All orders are sent by various couriers and tracking numbers sent to buyers. We check the progress of each order daily and keep you informed. My studio is equipped for washing, repair and restoration which can range from simple first aid to full scale reconstruction. I only carry our justifiable work. Please see the section on Cleaning and Repair which shows past examples of work. You are always welcome to ask questions about any hand woven rug or textile and I will do my best to provide answers from my experience and extensive library.